M. Justin McDermott is a graduate of New York University (B.A. ), Whittier Law School (J.D. ), Stetson University College of Law (LL.M. 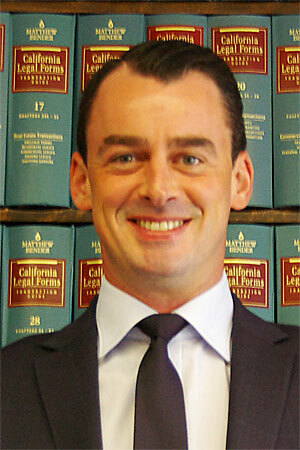 ), and a member of the State Bar of California. Mr. McDermott began his professional career in New York City at FGI Finance, a privately held international trade finance company. He then joined fellow NYU alumni and technology entrepreneurs in the role of Corporate Regional Sales Manager for Seamless, “The 4th Fastest Growing Privately Held Company in the U.S.” (Inc. Magazine “Hot 500” 2004). Exposed to Internet technology and live and on-demand video streaming services in particular, he co-founded Webcatter Broadcasting, Inc., and later Webcasting.com, Inc.
Discovering his passion for the law in the midst of selling his Internet interests, Mr. McDermott relocated to Southern California to attend law school. During his first year, he became a California Certified Law Student, and obtained a position as a Law Clerk at a personal injury firm in Manhattan Beach, California. During his third year, he was selected to be a Judicial Extern for the Honorable Margaret M. Bernal, Assistant Supervising Judge, Law & Motion, in Los Angeles County Superior Court. The only Whittier Law School student to be offered the opportunity to serve in the Law and Motion Department, he was Judge Bernal’s longest serving Judicial Extern. Mr. McDermott’s practical legal training introduced him to the law’s diverse nature, while deeply personal experiences inspired his commitment to the field of Elder Law. His dedication to serving the elderly, their families, and individuals with special needs, led him to earn his Master of Laws from the United States’ premier Elder Law program. Joining the Law Offices of Stuart D. Zimring in 2015, Mr. McDermott provides his clients with service oriented advice and compassionate counseling in the areas of Elder Law, Estate and Life Planning, Special Needs Trusts, Disabilities, Conservatorships, Probate, Trust Administration, and Veteran’s Benefits. He is a member of the State Bar of California (Trusts and Estates Section), the San Fernando Valley Bar Association (Probate and Estate Planning Section), the Los Angeles County Bar Association (Trusts and Estates Section), the National Academy of Elder Law Attorneys (NAELA) and the Southern California NAELA Chapter.